The debate about online interaction! Comment or not-to-comment? There are many talks in the corners if companies should open up for a two way communication by for example having a comment thread on their blog, or an open page on facebook. I love this debate because it brings forward so many different aspects of the challenges the different companies are facing. My personal opinion is; YES it should be opened up! The question is then how you deal with it. And this is a challenge for everybody! 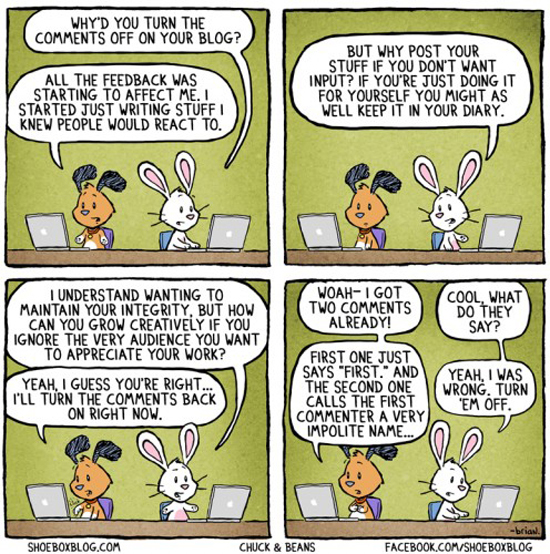 Yesterday I came by this little cartoon from the shoeboxblog.com that addresses the issues with humor!